including developed areas like the wooded suburbs we have in our area. Coyotes resemble a small, lanky German shepherd dog, but have wide, pointed ears, a long muzzle, yellow eyes, and an uncurled, bushy tail which is carried low to the ground. Their weight averages between 30-50 pounds. Eastern coyotes were first documented in Connecticut in the 1950s. Since then, they have expanded their range and are now common throughout the state. Coyotes are opportunistic and use a variety of habitats, including developed areas like wooded suburbs, parks, beach fronts, and office parks. Their ability to survive and take advantage of food sources found in and around these “man-made” habitats has resulted in an increase in coyote sightings and related conflicts. A coyote’s diet consists predominantly of mice, woodchucks, squirrels, rabbits, turkeys, deer, some fruits, carrion, and when available, garbage. Some coyotes will also prey on small livestock and poultry, and reports of coyotes killing small pets have increased in recent years. In Connecticut, unsupervised pets, particularly outdoor cats and small dogs (less than 25 lbs.) can be vulnerable to coyote attacks. Unfortunately, many pet owners are unaware of the presence of coyotes and the threat they pose, only to learn the hard way after their pet is seriously injured or killed by a coyote. As coyotes have become more common and occasionally prey on small pets, public concerns about coyotes attacking people, especially children, have increased. Although some coyotes may exhibit bold behavior near people, the risk of a coyote attacking a person is extremely low. This risk can increase if coyotes are intentionally fed and then learn to associate people with food. Follow the tips below to increase the safety of pets and livestock, enhance human safety, and learn how to coexist with coyotes. DO NOT allow pets to run free! Keep cats indoors, particularly at night, and small dogs on a leash or under close supervision at all times. The installation of a kennel or coyote-proof fencing is a long-term solution for protecting pets. A variety of livestock fencing and small animal pen designs can protect farm animals. Always walk dogs on a leash. If approached by a coyote while walking your dog, keep the dog under control and calmly leave the area. DO NOT run or turn your back. 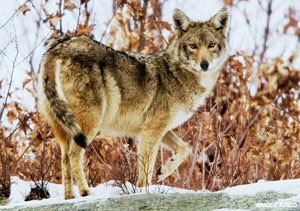 Coyotes are territorial and many reports of bold coyotes visiting yards, howling, or threatening larger dogs can often be attributed to this territorial behavior. Attempt to frighten away coyotes by making loud noises (e.g., shouting, air horn) and acting aggressively (e.g., waving your arms, throwing sticks, spraying with a hose). Be aware of any coyote behaving abnormally or exhibiting unusually bold behavior (e.g., approaching people for food, attacking leashed pets that are with their owners, stalking children, chasing joggers or bikers, etc.) and report these incidents to authorities immediately. Be aware of and report any coyotes exhibiting behavior indicative of rabies, such as staggering, seizures, and extreme lethargy. Daytime activity is not uncommon and does not necessarily indicate rabies. Regulated hunting and trapping may be used to remove problem coyotes in areas where it is safe and legal to do so. Contact the DEEP Wildlife Division at 860-424-3011 for more information on coyotes or other wildlife problems.